As Marvel gets set to amaze at New York Comic Con, see some of the most famous Marvel landmarks in NYC! Welcome to Marvel Tours! Step right up and find your seat on this state-of-the-art floating platform powered by genuine, patented Stark repulsors and we’ll get under way! Today we’ve got a special treat for you at the end of our journey -- you’re just going to love it! And throughout the tour please remember, folks, that only Marvel Tours offers this very special look at Marvel landmarks in and around the greatest city on Earth! We think it’s appropriate to start the tour here in Brooklyn right outside the actual tenement none other than Captain America grew up in back in the 1930s, verified by Cap himself. Look quick and snap a pic, because we’re off across the George Washington Bridge, the site of an infamous battle between Spider-Man and the Green Goblin several years ago. If you look to your right there across the East River you’ll see the Manhattan Bridge, which in the early 1940s took some punishment from a fight between Namor the Sub-Mariner and the original Human Torch. Alright, we’ve just entered the world-famous Greenwich Village, and we’re coming up to the alleged Bleeker Street address of Doctor Strange’s Sanctum Sanctorum. Look fast because if we spot it, it may be gone again in the wink of an eye! Is that it there…? Whoops, gone again! Regardless, it’s time to move along up the island to Hell’s Kitchen on the west side of Midtown. Keep your arms, legs, and valuables away from the edge of the platform, folks; this neighborhood’s got a reputation as the hangout of Daredevil and his Defenders chums and sometimes things can get pretty, well, fiery! 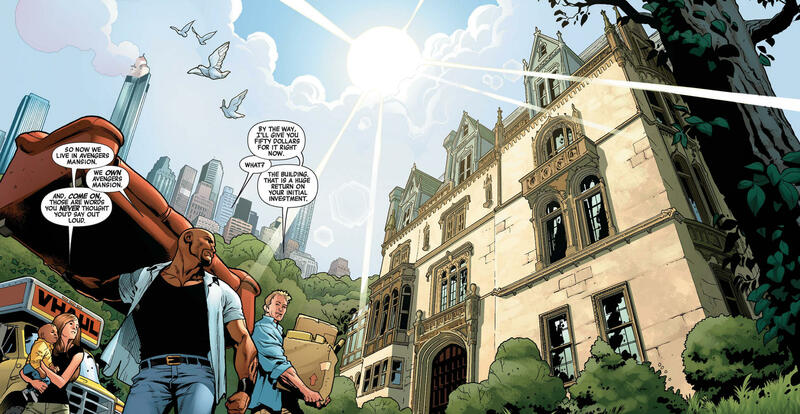 As we pass over the north end of Central Park and gaze at Harlem, the old stomping grounds of Luke Cage, who of course was once a member of the Fantastic Four, we’d like you to look there across the river and imagine the X-Men’s original home in Westchester County. On a darker note, you’ll see the infamous Ryker’s Island there in the middle of the river as we turn to head southward. The lockup’s seen the presence of many a dastardly evildoer over the years, including a few super heroes, too! No wonder there’ve been so many breakouts! 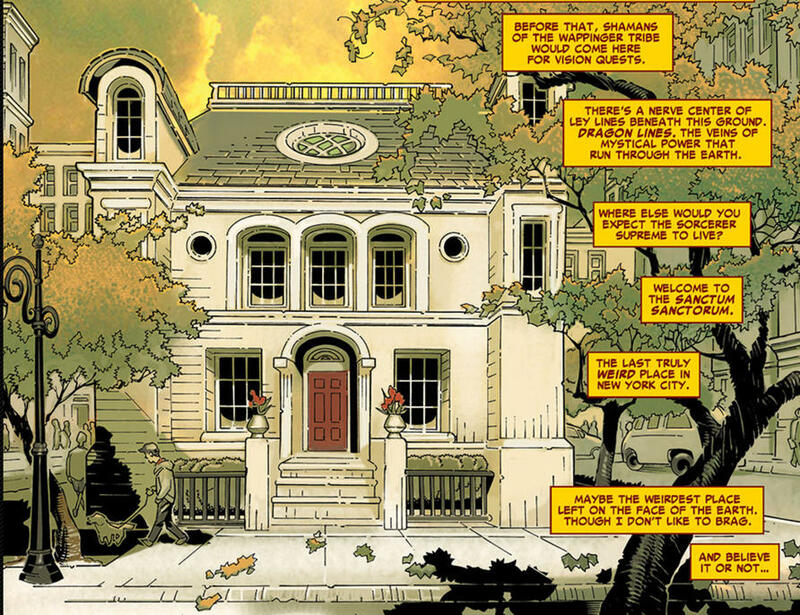 Now, let’s turn up the happy and show you a very special spot on the map: the original Avengers Mansion here in the Upper East Side on Fifth Avenue. This beautiful old pile is overflowing with the rich history of Earth’s Mightiest Heroes and has been destroyed several times! We’re hoping they’ve repaired the statues of the Founding Avengers, and… yes! There they are, made out of adamantium, no less! As we float past, please then swing your attention to that dark edifice there, the so-called Hellfire Club Mansion, which in the past housed a clutch of evil mutants dead-set on crushing the X-Men. Our tour’s coming to its last leg, folks, but don’t despair because we’ve still got another great landmark on the island to show you, like the world-renowned Daily Bugle Building. Yes, the newspaper that put Spider-Man on the map, so to speak, with editor-publisher J. Jonah Jameson’s ranting, err, strongly worded editorials on the webslinger’s menace! And still going strong today! Alas, as we move back into Midtown, it’s our sad duty to announce the end of this special Marvel Tour… by pointing out the last, but certainly not least, marvelous marker on the map: the Baxter Building! Yes, yes, we’re excited too, folks, because this is the legendary home and headquarters of the universally famous Fantastic Four! We told you we had something special at the finish of the tour, and here it is! Gaze up at the classic lines of the building and imagine the First Family of Super Heroes racing to and from it while on their adventures! See in your mind’s eye the towering figure of the world-devouring Galactus as he stood at its apex and threatened our planet with destruction! Hear the great roar of the Fantastic Four’s rockets as they lifted off from the Baxter Building’s roof! And finally, picture this entire structure lifting up off its foundation and heading toward space due to the machinations of the tyrant Doctor Doom! 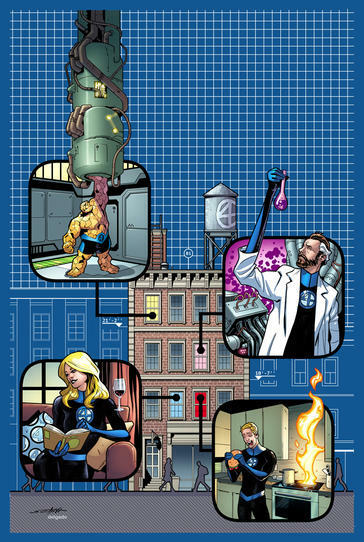 The Baxter Building has long served as the HQ of the FF...until November 28's FANTASTIC FOUR #4, that is! As previewed in this special FANTASTIC FOUR #4 variant cover by Valerio Schiti, Marvel's First Family is headed to a new home. When the group's latest adversaries, the Fanatstix, take up residence in the Baxter Building, Johnny, Ben, Sue, and Reed have to find new digs. So next month, they'll be moving to 4 Yancy Street! Hey, at least it's a familiar neighborhood. Folks, it’s been a real pleasure leading you on this tour, and we hope you’ll treasure the memories of it forever, and remember… long live the Fantastic Four and Make Mine Marvel Tours!